As one of the oldest and most prestigious land-grant colleges in the nation, the College of Agricultural and Life Sciences aims to engage its students in the search for practical solutions to the challenges of our ever-changing world. CALS offers 24 majors that lead students to a variety of careers and opportunities. Each academic discipline fits into the CALS priority themes: bioenergy and bioproducts, changing climate, economic and community development, food systems, health and wellness, and healthy ecosystems. The best way to learn about the College of Agricultural and Life Sciences is to visit our beautiful campus. CALS would love to show you around and provide an individualized experience. 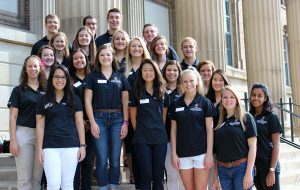 We will provide connections to our faculty and staff, major advisors and our personal CALS experts, the CALS Ambassador team. Whether you are a high school student wanting to learn more or a transfer student ready to transition into one of our 24 majors, we have a visit experience for you! Our CALS community is welcoming and inclusive for incoming students and their guests. We can’t wait to meet you and share all the reasons why we love the College of Agricultural and Life Sciences. Are you a student of color, LGBT or part of an underrepresented or marginalized population? We encourage you to visit our Diversity & Community page to explore our personalized list of support resources and learn about our efforts to create a positive campus environment for minority students. UW-Madison has a central Office of Admissions and Recruitment for all students. After acceptance, students can select a school or college. Want to know more about the city of Madison? Visit madison.wisc.edu. CALS has an average undergraduate population of 3,300 students. It’s also home to over 800 graduate students pursuing masters and doctoral degrees.